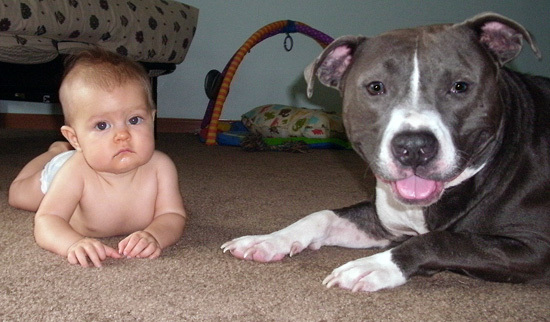 I was always one of those anti-pit bull people. I will be the first to admit that I knew nothing about the breed, or its loving and loyal nature. All of that changed when my husband and I started to volunteer at our local animal shelter. We lived in an apartment that allowed no pets at all, not even a goldfish. We walked the dogs and provided some love and affection that these poor animals desperately needed. As I walked toward a small kennel on the end, I found a small grey/blue 3-year-old pit bull, sitting calmly and minding his own business. No barking or scratching . . . nothing, just patiently waiting for some love. Our 3-year-old girl instantly fell in love with this “beast” they called Charlie. 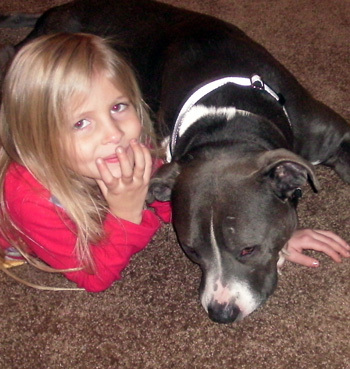 From the first moment we took him out on a leash and she was able to walk without him pulling her, we knew that he was the perfect dog for our family. Charlie had been in that shelter for two months before we met him, and when he came out we saw why. He was covered in scars, scabs, and bite marks, with skin that seemed to flake off in giant chunks. We were fed a sob story about a previous family that moved to an apartment that didn’t allow the breed, but one look at Charlie showed that he was probably fought. We bought a house so that we could bring that big baby home, and two months later Charlie was safe on a five-acre country lot. Not long after that, we walked into the shelter to be greeted with the statement “We’re so happy you came in today. We just got in a little girl. She is a 2-month-old blue pit who was abandoned in a trailer for seven days in a small crate with no food or water and living in her own stool. We need a home for her.” I walked around the corner and instantly fell in love! She was so small, and it was obvious that she had no human interaction at all. She was painfully timid and terrified of the world. I turned to my husband, and he knew what that look meant – I WANT HER! The facility was giving the girl that abandoned the puppy seven days to come back and claim her, which I found insane – she abandoned this poor creature once, why on earth are we allowing her a chance to do it again? After five days I couldn’t see her in doggy jail anymore. We arranged for her to be “fostered” with us for the rest of the waiting period, and after two nail-biting days we officially brought our little girl to her forever home. She has become Lucy Lu, and is now happy at home with our three children, one of whom is 8 months old and Lucy’s best friend in the entire world.